David Johnson is currently Director of the Metro South and Ipswich Nephrology and Transplant Service (MINTS) and Medical Director of the Queensland Renal Transplant Service at Princess Alexandra Hospital, Brisbane, Australia, Professor of Medicine and Professor of Population Health at University of Queensland, and Director of the Centre for Kidney Disease Research, Brisbane, Australia. He has a number of international leadership responsibilities, including President of the International Society for Peritoneal Dialysis, Councillor of the International Society of Nephrology, Co-Chair of the ISN Global Kidney Health Atlas, and Co-Chair of the Global PDOPPS Steering Committee. His national leadership positions include Chair of three separate CARI Guideline Working Groups (Peritoneal Dialysis Adequacy, Evaluation of Renal Function and Management of Early CKD), Chair of the Primary Healthcare Education Advisory Committee to KHA (PEAK – Kidney Check Australia Taskforce), Co-Chair of the Australasian Creatinine and eGFR Consensus Working Party, Co-Chair of the Australasian Proteinuria Consensus Working Party, Deputy Chair of the Australasian Kidney Trials Network, and Member and Past-Chair of the ANZDATA Registry Peritoneal Dialysis Working Group. He was Chair of the Queensland Statewide Renal Clinical Network from 2008 until 2013. 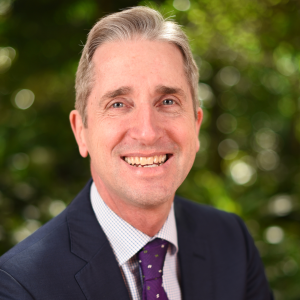 He is the principal investigator on a number of large, multi-centre randomised controlled trials, including the balANZ, HERO, IDEAL, IMPENDIA, HONEYPOT and CKD-FIX trials, and is chair of the Data Safety and Monitoring Board for the FINESSE trial. He has published over 780 original manuscripts in peer-reviewed journals and presented over 450 abstracts at national and international scientific meetings. He has won numerous research awards for his clinical and basic science studies in the areas of peritoneal dialysis outcomes, cardiovascular risk factor modification in uraemia, renal transplantation, dialysis unit infection control, treatment of acute kidney injury and mechanisms of progressive chronic kidney disease. In 2005, he was awarded the TJ Neale Award by the Australian and New Zealand Society of Nephrology for “outstanding contributions to nephrologic science.” He was a Queensland finalist in the Australian of the Year Awards for 2009. On Australia Day 2011, he was awarded a Public Service Medal by the Governor-General of Australia for outstanding public service, particularly research into the early detection and management of kidney disease. He also successfully co-ordinated the largest-ever evacuation of dialysis patients in Australia during the Cyclone Yasi crisis in 2011. In 2014, he was awarded an International Distinguished Medal by the US National Kidney Foundation and in 2017 he was awarded the Dimitrios Oreopoulos Award by the Canadian Society of Nephrology.